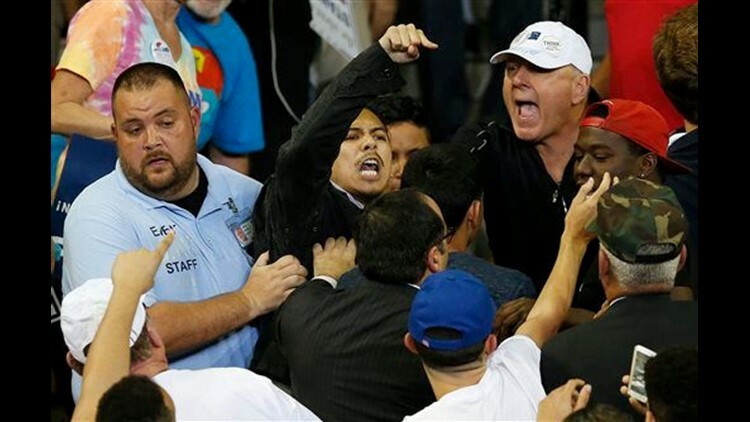 CHICAGO (AP) — As Republican presidential front-runner Donald Trump attempts to unify a fractured GOP around his candidacy, images of his supporters attacking protesters and allegations that he's inciting violence are casting new attention on the divisive nature of his candidacy. Trump rejected the idea that he was responsible for the incidents and allegations he sets a tone at his rallies that encourages violence. "I hope not. I truly hope not," Trump said, explaining that his debates draw thousands of people who are filled with emotion. "People come with tremendous passion and love for the country," he said. "When they see what's going on in this country, they have anger that's unbelievable." Trump will hold a pair of rallies on Friday in two states that vote next Tuesday. The first in St. Louis at the city's Peabody Opera House, the second at an arena at the University of Illinois at Chicago — a civil and immigrant rights organizing hub with large minority student populations. The renewed attention on Trump's rallies comes after a white Trump supporter was charged with assault Thursday after video showed him hitting a black man being escorted out of the venue by sheriff's deputies at a campaign rally Wednesday in North Carolina. Last year, video captured Trump supporters physically assaulting Mercutio Southall Jr., an African-American activist, at a rally in Birmingham, Alabama. "He was a rough guy and he was punching. And we had some people - some rough guys like we have right in here - and they started punching back," Trump said. "It was a beautiful thing." In an interview broadcast Thursday on MSNBC, Democratic presidential front-runner Hillary Clinton said she was "truly distraught and even appalled by a lot of what I see going on, what I hear being said." "You know, you don't make America great by, you know, dumping on everything that made America great," she said, "like freedom of speech and assembly and, you know, the right of people to protest." Colvin reported from Fayetteville, North Carolina. Associated Press writer Sara Burnett contributed to this report.